CooksRecipes special collection of family-favorite recipes for salads that you can count on for successful deliciousness. 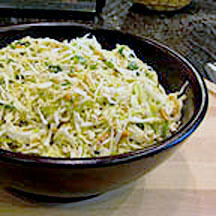 A tasty cabbage salad with buttery toasted almonds, sesame seeds and crunchy ramen noodles tossed with a just-right, sweet-tart rice vinegar dressing. 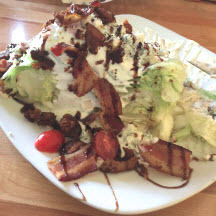 One of life's simple dining pleasures is this entree salad made with crisp iceberg lettuce, bacon, onion, tomatoes, blue cheese dressing and a drizzle of balsamic syrup. 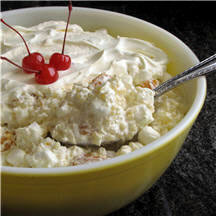 This old time favorite is delicious as a salad or dessert. The recipe uses a tiny round pasta called Acine di' Pepe which gives it an interesting texture similar to tapioca.